Justin Wilson is the Tigers' new closer, so now that we've got this whole bullpen/closer conundrum completely and totally solved with zero chance of anything going wrong, we can finally start taking a more detailed look at the starting pitching, which is -- as it was last year -- a team strength that will keep this team contending for a division title. As I was saying, the Tigers' starting rotation has the fourth-worst ERA in the American League, and a FIP that is only marginally better. That, combined with a bullpen that has been (up until now) the worst in baseball at almost everything they do, suggests that we should be looking a last place team, not a team that's still over .500 and only a game-and-a-half out of first place. Some of that can be explained by "meh, baseball is weird" and "hey, it's still early in the season." After all, the Indians' starters have the rock-bottom worst ERA in the American League, and they're in first place. We're still in process, results are still coming in, and the sample sizes are still small enough that the numbers can shift radically in the space of a week or two. Let's not worry about the Tigers' starting rotation and their ERA just yet. They did give up 19 combined runs in three games during the first two weeks of the season, and that's just the sort of monkey wrench that will artificially inflate a team's collective ERA. However, there is another disturbing trend that has held true since the start of the season: hard contact being made against pitches thrown by Tigers starters. The league average for hard contact against starting pitching sits at around 32 percent. For the first two weeks of the season, Tigers starters were giving up hard contact 41 percent of the time. They brought that down a bit in the next two weeks to 37 percent, but in the following games since the start of May, that rate jumped to 43 percent. On the season overall, the hard contact rate against the starters sits at 40 percent. Non-geek version: batters have been barreling up against the starting rotation since the season started, and that trend is holding steady. This is a sports post, and it's on the Internet, so obviously we have to start pointing fingers and figuring out who's to blame. Our pricey "Number Two" starter has two problems: he's throwing balls in the strike zone at a rate below league average (and well below his career norm), and he's got the worst swing-and-miss rate in the rotation. On the plus side, his walk rate of 7 percent is the best of the bunch, and he's right at league average for going deep into games, at 5 2/3 innings. The center-piece of the David Price trade is struggling out of the gate. He's only at league average for swings and misses, while his strike-throwing rate and walk rate are both worse than a typical MLB pitcher. He's missing the strike zone and not missing many bats when he does throw strikes. All of that leads to a 43 percent hard contact rate and an average game depth of 5 1/3 innings per start. The team ace has ramped up his velocity this year and is still getting deep into games (six innings per start), but the eye test says he's still trying to get a feel for some of his usually great pitches, and the numbers support that: an average number of pitches in the strike zone, a below-average swing-and-miss rate, and an above-average walk rate. He's getting hit harder than the average MLB starter to the tune of eight percentage points. The "throw-in" of the David Price trade has been flashing signs of being a solid Number Three Starter (if not better), sitting at an average number of innings pitched per game and a normal number of pitches in the strike zone. Which is what makes it weird that his walk rate is at least two percentage points higher than normal. A clue: his whiff rate is slightly above average, and his hard contact rate -- which is still worse than league average by 7 percent -- is the second best on the team. It's like a hangman puzzle with numbers: normal amount of strikes, better-than-average at missing bats, but walking too many batters. Maybe he's just throwing all of his non-strikes at once. The reigning Rookie of the Year pitched like an Ace 1b last year, and at least for the moment, he's the best starter on the team in almost every category: most strikes, tied for fewest walks, most swings-and-misses, lowest hard contact rate (31 percent, slightly better than league average), and best longevity at 6 2/3 innings per game. At the moment he's the only reason the overall team numbers in these categories don't look worse than they do. The fact that this starting rotation has the worst hard contact rate in all of baseball is a concern. If opposing batters are squaring up our starters on the regular, eventually that will translate into more hits, more extra base hits, more home runs, and more runs given up. The starting rotation BABIP (batting average on balls in play) is about 10 points lower than average, so either they're getting lucky or stellar defense is bailing th--hahahahahahahahahahahahahaha just kidding, it's totally luck. But will it stay this way? Michael Fulmer is fine. 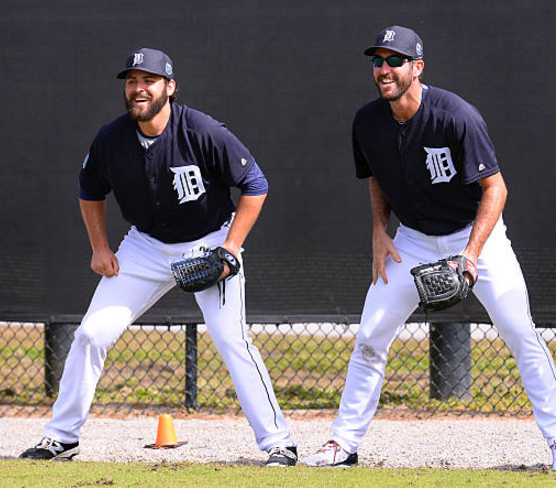 Justin Verlander is an established ace, and if I had $100 to bet, I'd spend it on a steak dinner because gambling is stupid, but I'd still tell you between bites of sirloin filet that Verlander is fine. He'll tweak his grip, his mechanics, his pant size, or whatever, and start getting more whiffs, walking fewer batters, and generating more weak contact. Matt Boyd is Matt Boyd. Just let him be who he is. Norris and Zimmermann are the only real concerns. Norris, because he hasn't established a consistent track record and his command has been wonky ever since 2015. I know he's Got Great Potential and has a Higher Ceiling, but he's going to need to start showing that he can throw more strikes and actually get through six innings. Zimmermann is a concern because he's doing stuff that isn't normal for him, and he's been doing it for a calendar year. Compared to his career numbers, his performance since 2016 has featured fewer innings pitched per game, more walks (fewer pitches in the strike zone), fewer swings and misses, and as a result, a strikeout rate that's a full two batters-per-nine-innings lower than his already-low(ish) career rates. Zimmermann is going to be a big key to this year's team success. Norris is still developing, and you can hide some of his growing pains if you've got a solid Number Two Starter like Zimmermann firing on all the correct cylinders. Until that happens? Keep an eye on that starting rotation ERA.